You will be given a reference e-book to read which has 482 pages And the test will be based on that e-book , you can take final test within 1 year of purchase. Personal finance refers to the process of applying certain financial principles when it comes to formulating monetary decisions. It typically focuses on ensuring that individuals and families formulate sound monetary decisions by sticking to the underlying principles of finance. Personal finance also addresses the specific ways through which families and individuals acquire, save, spend and budget financial resources while taking into consideration the many financial risks and future events. If you are one of those who want to start to effectively plan for your personal finances, then be aware that there are a few financial products that you should take into account and these include banking products such as consumer loans, credit cards and savings and checking accounts and insurance and investment products such as life insurance, disability insurance, health insurance, mutual funds, bonds and stock market. Effective planning for your personal finances will also require you to participate in and monitor your retirement plans, income tax and social security benefits. Personal finance also covers all financial activities and decisions of individuals including investing, mortgages, debt servicing, insurance, savings and budgeting. It involves the process of effectively analyzing your present financial condition and forecasting your financial needs in the future. Personal finance also requires you to spend time looking at how you manage your money and your future. It also covers aspects linked to creating a budget for emergency funds, setting your financial obligations and monitoring and controlling your spending. 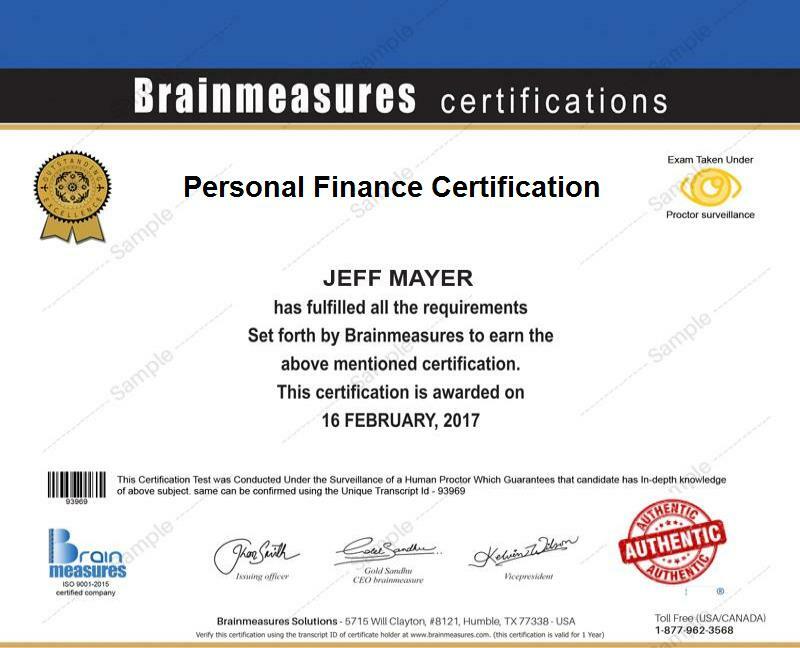 If you want to want to completely understand personal finance, then know that Brainmeasures, a reputable online certification company which never fails to satisfy the needs of people to learn, offers a personal finance certification program. This personal finance course from Brainmeasures is filled with information which will allow you to learn everything about personal finance management and planning. The knowledge and skills that you can get from enrolling in this personal finance certification course will allow you to become an effective certified financial manager who knows exactly how to manage and handle all the finances of a person. You can also expect to become a more effective personal financial planner because the personal finance certification course is capable of providing complete and accurate information about all the major components of financial planning including assessment, goal setting, creating a plan, execution and monitoring and reassessment. Receiving your certificate in the field by enrolling in the personal finance certification course offered by Brainmeasures will definitely transform you into an expert in handling, monitoring and managing personal finances. The personal finance certification program which is now available at Brainmeasures targets all kinds of people and professionals who are interested about improving their knowledge about personal finance and the strategies and principles that can be used in personal finance planning and management. Personal finance certification course is also a good choice for you if you are an aspiring or existing financial planner or manager who wishes to acquire good money management skills that will allow you to successfully handle all your tasks and responsibilities. Personal finance certification holders can expect to work in well-paid positions. But you have to remember that your salary will be dependent on your experience, performance, your employer and the location of your work. Most of the holders of personal finance certification say that they are earning around $91,000 per year. This can grow up to $166,000 as soon as you start to hold high-ranking positions.